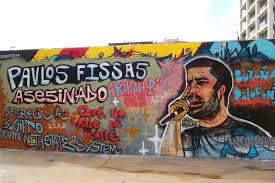 Since the assassination by the neo-Nazis of Chrissi Avghi (“Golden Dawn”) on the night of September 17-18 of Pavlos Fyssas, a rapper known by the pseudonym Killah P who was an organizer of antifascist concerts and an antifascist activist, antifascist mobilizations have multiplied in Greece. Starting on September 18, tens of thousands of protesters took to the streets of several Greek cities to say “never again!” The police repression of the protests has been widely criticized in the media. The antifascist protests continued the following day, culminating on September 25 with demonstrations by all the trade unions and the political organizations of the left. Faced with this pressure, the neoliberal government even began to look into the many abuses of the neo-Nazi party, which up until then had enjoyed impunity. Investigations began into the links between the neo-Nazi gangs and the police, forcing the resignation of nine officers of the police and its “anti-riot” squads. On September 28, the Samaras- Venizelos government (New Democracy-PASOK) finally decided to take action: six neo-Nazi MPs, including Golden Dawn leader Nikolaos Michaloliakos were arrested and the premises of the neo-Nazi party were raided. This is not the first murder by the Greek neo-Nazis. Since the assassination of a Bangladeshi in May 2011, more than 300 racist attacks have been identified, including at least six led by Golden Dawn MPs, involving the murder of several immigrants and severe injuries inflicted on many others. These racist attacks have since been extended to trade-union and left activists. On September 12, a Nazi gang attacked Communist Party (KKE) activists who were fly posting in an area of Piraeus, seriously injuring nine of them. Did we have to wait for the victim of the Nazis to be this time a well-known Greek singer for the neoliberal government to begin to worry about neo-Nazi violence? On the evening of September 17, Pavlos Fyssas, along with his companion and some friends, was watching a football match in a cafe in Keratsini, in the west of Piraeus. Neo-Nazis invaded the cafe and after some tense exchanges, Pavlos and his friends tried to retreat. With his girlfriend and another couple they were intercepted by a group of 15-20 fascists in the uniform of Golden Dawn, who shouted at them: “What are you looking for? You know that there is no place for you in this neighbourhood.” As the two couples moved further on, another group of 10 neo-Nazis emerged from another side-street and managed to surround them. Then there arrived, driving the wrong way down a one-way street, a car from which a local activist of Golden Dawn, Yorgos Roupakias, got out and stabbed the young antifascist rapper. All this happened in the presence of a team of police motorcyclists (DIAS), who observed without intervening until the majority of fascists had left the scene, while Pavlos Fyssas was lying on the ground, mortally wounded. A young policewoman intervened alone, throwing the murderer to the ground, pinning him down, pointing her gun at him and handcuffing him. Apparently she shouted to her colleagues to hurry up and help her and they did not do so on the grounds that “there were a lot of delinquents about”. After the murder, the newspaper Ethnos interviewed a former member of one of the armed gangs of Golden Dawn. This person stated that the “assault squadron” based in the Nikaia area (in Piraeus), was led by Yorgos Patelis, who himself was directly under the authority of Golden Dawn MP Ioannis Lagos. Concerning the mobilization of Golden Dawn members on the fateful night, he said that if there was anything happening in the neighborhood, “everyone would have informed Yorgos Pantelis, who would in turn inform Lagos, who controlled all the actions of the branch. If we had agreement from him, we could go out into the streets. To tag our slogans on the walls of the city, or to attack Pakistanis, Pantelis and Lagos had to be informed.” According to him, Roupakias was “deputy leader” of this assault squadron, which was trained by the police of the anti-terrorist unit EKAM. And both their headquarters (the official office of Golden Dawn in Nikaia) and their thugs were well protected: an officer from the Nikaia police station, a member of Golden Dawn, warned them of any investigation into them and took care of their members who were caught red-handed. All the evidence gathered to date indicates that the murder of Pavlos Fyssas was the result of a premeditated attack and an organized ambush. Murders are increasing: after the killing of a young Bangladeshi in May 2011, a young Iraqi was stabbed to death in August 2012 in the centre of Athens, and last winter a Pakistani worker, Shahzad Luqman, was killed in the middle of the night on the streets of the Greek capital by a neo-Nazi of Golden Dawn. According to Radio France Internationale (RFI), the number of those injured runs into hundreds. Let us recall some cases. In June 2012, Saleh Ibrahim, a young Somali exile, 26 years old, was in a square in those northern suburbs of Athens from where immigrants have been driven out regularly for the last three years. He was assaulted by a group of six people armed with wooden clubs, and ended up in hospital with his arm in a cast for three weeks. “Should I change my skin colour? And if I could, would they really would stop persecuting us?” He asked on RFI. In August 2012, while Hassan Mekki, a Sudanese migrant, was walking through Athens in the company of a Mauritanian friend, motor cyclists waving Greek flags and shouting “go home, niggers!” hit him on the head. He woke up only hours later, covered in blood. His assailants had scarred him for life with two crosses cut into his back. “I do not have the necessary papers, so I cannot ask for help. I can’t sleep any more. I’m afraid they are following me, that my life is in danger,” he explained to Reuter’s agency, which published his photo without showing his face. Waleed Taleb, an Egyptian, worked in a bakery on the island of Salamis. He made the mistake of asking for unpaid wages in autumn 2012. His boss, a former mayor of Salamis, and two other men tied a metal chain eight meters long around this neck and led him to a stable. A fourth man joined them there. There, the Egyptian was tied to a chair and beaten. Although he was sometimes unconscious, his assailants made him drink beer – they drank too – and mocked him because he was a Muslim. “They walked me like a dog. I thought it was the end for me. I fainted, and every time they hit me with rods to wake me up.” The suffering of Waleed Taleb lasted 18 hours, after which he managed to escape, taking advantage of a moment’s inattention by his captors. But that was not the end of it: taken to the accident and emergency department after being found in the street, still with the metal chain around his neck, the man was arrested by police as an undocumented migrant. “Everyone could see that I was suffering. I could not even see, and I could not eat. I thought I would die”, he explained to Reuters, a month after the attack. His employer was arrested and released after three days, awaiting trial, as were his alleged accomplices… On the other hand, Waleed Taleb spent a month in a detention centre and was notified that he had to leave the country. The expulsion was finally “suspended” by a minister, faced with the outcry over the report that was published by Reuters in December 2012. Such attacks have become commonplace. The Golden Dawn thugs sometimes benefit from the help of the police. Thus, the site Rue 89, in September 2012, told the story of a resident of Kalamata (in the southern Peloponnese), who, having seen a “black man” in his garden, called the police. The policeman at the other end of the line replied that the police would not come, but that she could turn to … Golden Dawn, dictating for her the phone number of the local Nazi headquarters! Shocked, she refused to do so. But without having been called by her, the neo-Nazi squads appeared in her neighbourhood, and not finding the unknown man who had been reported, set fire to the nearby house of a Pakistani. Golden Dawn militants are also posing as police officers. This was the case on July 26, 2013, during the attack against a centre for migrants in Tavros, south- west of Athens. That day, six men came to the centre claiming to be part of the police force, before revealing that they belonged to the neo-Nazi party and violently assaulting migrants, after having confiscated their work permits. Beginning in February 2013, several Golden Dawn thugs, dressed in the black t-shirts of the party, descended on the Panarkadiko hospital in the town of Tripoli and burst into the patients’ rooms, demanding in a very threatening manner to know the nationality of the “apoklistiki” (nurses hired by families to watch over one of their relatives who is seriously ill) who were at the bedside of patients. The director of the hospital, Eleni Siourouni, said in a joint press conference with the neo-Nazis, “on the question of foreign nurses coming from outside, the hospital management has a common goal with Golden Dawn”! In this way the neo-Nazis play the card of the “competition” between Greek nurses and immigrant carers, whereas this situation is the result of cuts in funding and the decline of the hospital system. The next day, about forty members of Golden Dawn conducted an operation of intimidation against the clinic of Médecins du Monde (MDM) in Perama, a suburb of Piraeus, where patients who cannot pay are treated, regardless of their origin. These hate-motivated activists chanted vile racist slogans against MDM. Showing their descent from their German Nazi ancestors, the Greek neo-Nazis have attacked national minorities (in Xianthi their gang attacked a Turkish-speaking schoolteacher). They announce that “the time will come” for the disabled and for people with hereditary diseases (they advocate for them forced sterilization and euthanasia “in order to purify the blood of the Greeks”), for homosexuals (who would have to choose between “changing their sexual preference “and “paying the penalty”: in August 2012 leaflets saying “you’re next, after the immigrants” appeared in gay clubs in the Athens area). In 2012 they already injured Greeks who dared to protest against their abuses (a customer expressing his outrage at the wrecking of a hair salon run by a Pakistani in Athens in October 2012, a teacher putting up posters for a demonstration in defence of education in September 2012). Acting together with fundamentalists of the Orthodox Church, Golden Dawn managed to stop the performances of an avant-garde theatre play deemed to be “blasphemous” in Athens in October 2012. In Crete, on the occasion of the celebration of the National Day on October 28, 2012, a witch hunt targeted teachers whose “patriotism” was considered “insufficient.” Also in October 2012, the headmaster of a high school in Athens threatened his students with calling in the Golden Dawn heavy squad… The process of selection does not stop there: according to Golden Dawn, only “Greeks by birth and by consciousness” would have political rights, naturalized citizens and those who “did not think in the right way” would be excluded. In October 2012 the Greek Parliament reacted, voting to lift the parliamentary immunity of four Golden Dawn members accused of various abuses, including Ilias Kassidiaris, spokesman for the neo-Nazi party, who was charged with being an accomplice to armed robbery. This in no way hindered their actions. On 19 May 2013, at the head of a rally to prevent the construction of a mosque in Athens, Kassidiaris harangued: “If a mosque is built for the Islamist criminals in Greece, a front of 100,000 Greeks led by Golden Dawn will be created.” At the same time, Muslims in Athens received a letter stamped with the logo of the party threatening them in Greek, Arabic and English with being “slaughtered like chickens” and with “blood being shed” if they did not leave the country without asking for what was due to them. It was in 1990 that the Golden Dawn organization held its first congress. In neighbouring Yugoslavia, the post-Titoist bureaucracy was then fostering nationalism in order to divide the rising social and democratic struggles. Echoing this, in Greece in 1992 the bourgeoisie instigated a nationalist and xenophobic wave, directed first of all against the recognition of the Republic of Macedonia and then against the influx of Albanian immigrants when the regime in Tirana collapsed. This was the resurgence of an aggressive and militaristic nationalism, which was inspired for nearly a hundred years by the “big idea” of wanting to make the country the crucible of the reconstruction of the Byzantine Empire, by conquering Constantinople, an ambition that the catastrophic defeat of the Greek army by the Turkish army in 1922 definitely ruined. The ideology of Golden Dawn attempts to resurrect the “big idea” and claims that “the Greeks are a special people, unique, with a unique language, with roots in Antiquity and very ancient references”. This caricature of history fitted in perfectly with the rise of chauvinism, the “climate of fear and insecurity” and the “national dangers” posed by the question of the name of Macedonia”. “Golden Dawn made its first political appearance at the great Pan-Hellenic demonstration in 1992 on the question of the Republic of Macedonia. Most political parties at the time were demonstrating ‘nationalist hysteria.’ Golden Dawn was therefore an integral part of the current of political thinking at the time. What is interesting is the parallel that can be drawn between the extremism of the political messages and slogans of 1992 and those adopted by Golden Dawn today,” explains Dimitris Psarras. As for the pagan, paganistic ideology of the neo-Nazi party, it has been increasingly eclipsed – at least in public – in favour of the Orthodox religion, one of the pillars of Greek national identity. “Although, since its foundation, Golden Dawn has produced anti-Christian texts, it has successfully adopted the strategy of the fascist parties of the inter-war period: do not attack religion in public. It presents itself, on the contrary, as a defender of Orthodoxy, more precisely of the “Greek Orthodox race”, says Stavros Zouboulatis, author of “Golden Dawn and the Church”. Appointed head of the neo-Nazi youth, the boyfriend of the daughter of the “archigos”, Arthémios Matthéopoulos, also heads up a music group with a significant name: Pogrom. He is credited with, among others, the song “I will go to Parliament, I will set it on fire, I will light up the whole city” (he has since become an MP) and the revisionist song “Auschwitz” . The wife of the Greek Führer, Eleni Zaroulia, MP, appointed by the Greek Parliament to the Commission on Equality and Non-discrimination of the Parliamentary Assembly of the Council of Europe (!) summarized in October 2012 the point view of her party. In a speech to Parliament, she launched into a tirade, denouncing the rights granted, according to her, to immigrants, whom she described as “subhuman” and demanded separate treatment for those “ethnic Greeks” who had arrived in large numbers, in particular from Albania and Russia, loudly supported by her parliamentary group: “It is unacceptable that they are put in the same category as this kind of subhumans who have invaded our country, with all the diseases they carry around with them.” . In the 1994 European and 1996 parliamentary elections, Golden Dawn failed to get more than 0.1 per cent of the vote. In 2004, having camouflaged itself in a “Patriotic Alliance” with other grouplets, it obtained 0.17 per cent of the vote in the European elections and in 2006, under the same acronym, 1.34 per cent in the municipal elections in Athens. Standing again under its own name in 2009, the neo-Nazi party won 0.29 per cent of the vote in the legislative and 0.5 per cent in the European elections. It was not until the November 2010 municipal elections that Golden Dawn managed to make a breakthrough, getting 5.3 per cent in Athens, where Michaloliakos became an alderman. With the crisis, the traditional two-party system based on New Democracy and PASOK began to collapse. But it was after LAOS (Popular Orthodox Alert), a traditionalist far-right party, joined in November 2011 the government of Lucas Papadimos imposed by the Troika (IMF, European Central Bank, European Union) that an electoral space opened up on the right. In May and June 2012 the Nazi party obtained respectively 6.97 per cent and 6.92 per cent, 21 and 18 seats in parliament. Since then, up until the end of September 2013, the polls showed it increasing its support, indicating that it could get more than 15 per cent of the vote. And if in June 2012, according to a study, the neo-Nazi party got 20 per cent in the polling stations where members of the police vote, in summer 2013, according to some polls, its popularity among the police was close to 50 per cent. The extremely brutal austerity policies carried out by successive governments under the control of the Troika from 2009 led to a collapse of the relationship between the representative character of the dominant political parties, PASOK and New Democracy (ND). At the same time the rules of the democratic system were being flouted. Increasingly, governments legislated by decree, strikes were declared illegal and employees were requisitioned (during the Athens Metro strike in January 2013, for example). Following on from its predecessors, the present government has made racism state policy. Veritable concentration camps have been built for undocumented aliens. In July 2012, the government launched a massive crackdown on immigrants, cynically called “Xenios Zeus” (from the name of the god of hospitality!). It also legitimized the participation of Golden Dawn in political life by giving echo to the so-called theory of “two extremes” in order to criminalize popular resistance movements and the radical Left, especially SYRIZA, which had become at the last elections the second party in the country. This theory, propagated by the media, legitimized the neo-Nazis. The brutal repression of anti-fascists was accompanied by tolerance of the authorities concerning Golden Dawn. For example, on 9 October 2012, the British newspaper The Guardian published the testimonies of dozens of anti-fascist activists who had been tortured by police after being arrested during a protest against Golden Dawn. Real life is very far from the success that the government claims to have achieved: the unemployment rate has risen in four years from 7.8 to 27 per cent of the workforce, one in three Greeks has no income, the pensions of more than two thirds of retired people are less than €675 per month, 150,000 civil servants have been sacked, the reduction in wages is as high as 50 per cent, taxes have been steeply increased, more than half of the population can no longer afford to buy drugs …but the public debt – which the austerity measures were supposed to bring down – is increasing, while GDP has continued to decline for the sixth consecutive year. Added to that is the way that European politicians and the media have presented a humiliating image of Greeks since 2010, which has made a growing number of them to be angry and to feel that there is a conspiracy against them. A study of “political evolution” conducted in February 2012 showed that the vast majority of the Greek population used the terms “disappointment” and “anger” to express their feelings towards the government, the media, the trade unions and the political opposition. 50 per cent of them were afraid of losing their jobs, 90 per cent felt that their wages would be reduced and 80 per cent demanded the immediate expulsion of illegal immigrants! In 2011, the “Eurobarometer” indicated that according to 71 per cent of those polled in Greece, the European Union has “acted in an ineffective way”. The neo-Nazi party has been able to take advantage of this social crisis. With a huge echo in the media, it has conducted “humanitarian” operations reserved for Greeks alone: a spectacular distribution of food in the central square of Athens, the establishment of an “employment agency”, the announcement of medical aid which was nicknamed “Doctors with borders”, an attempt to create a “Greek blood bank” (which fortunately failed thanks to the hostility of the medical profession). According to Dimitris Psarras “there was more publicity than actual aid”. Sometimes it was simply a question of scene-setting: thus the prominent newspaper Proto Thema carried a headline, “The ‘scouts’ of Golden Dawn – people are being attracted to the extreme Right,” with an illustrated report covering two pages on the “real protectors of distributors in the city centre, members of Golden Dawn [who] protect especially women and the elderly who, whenever they want to go to the bank, call on “one of those guys” to accompany them.” The pensioner whose photograph was spread across the front page and whose dramatic statements about the insecurity caused by non- Greeks were widely quoted, was the mother of a local neo-Nazi leader, a candidate in the electoral district of Athens-centre. Immediately after the assassination of Pavlos Fyssas, the Greek authorities procrastinated. Although the Minister of Public Order, Nikos Dendias, ordered the transfer of 32 pending cases to the procurator of the Supreme Court and decided that the investigation of abuses by members of Golden Dawn was now to be assigned to the counterterrorism services and not to the ordinary police, everyone remembered that in October 2012 he had said that “the government will not tolerate the action of storm troopers”, without that changing anything. A parliamentary debate on Golden Dawn asked for “as an emergency” was postponed, ostensibly because of the schedule of the Prime Minister. In reality, the government, which only has a majority of four seats and whose component parties have dropped in the opinion polls, is afraid of the divisions in its own camp, because some conservative politicians have established links with Golden Dawn, which they see as a possible point of support against the radical Left. In addition, this unpopular government fears the threats of Michaloliakos, who has announced that he will create “political instability” by making his 18 MPs resign one after the other in order to cause “non-stop elections.” But the Samaras government found itself with its back to the wall. Greece takes over the presidency of the European Union in January 2014 and the pressure from both Germany and the United States was becoming stronger, for the “President of Europe” not to be open to the accusation of complicity with neo-Nazis. The political base of Samaras was crumbling and Golden Dawn could potentially challenge the hegemony of ND within the right bloc. Samaras himself was under attack from within his own party, as some of its leaders hoped to be able to rely on Golden Dawn to reorganize the right bloc as a mass movement against strikes and against the Left. Forced to attack Golden Dawn, Samaras and Deputy Prime Minister Venizelos (PASOK) have chosen to appear as guardians of democracy, hoping to regain the legitimacy they need to impose a new memorandum. Wolfgang Schäuble, the German finance minister, has made it clear that the loan of €77 billion would be subject to a new set of austerity measures. The leaders of the government parties are proposing a “constitutional arc” in the hope of creating division between, on the one hand, the denunciation of the practices and the ideology of the neo-Nazi party and on the other the social mobilization against Golden Dawn and against the austerity policies. The arrest of six members of Golden Dawn on September 28, including its leader, Nikolaos Michaloliakos, has led some of the media to say that the neo-Nazi party has been “beheaded”. But although four of them were charged on October 2 with “establishing and belonging to a criminal organization”, three of them, including the party’s spokesman, Ilias Kassidiaris, were released on bail and left the court victorious. Only one, Ioannis Lagos, was remanded in custody. The neo-Nazi leader Michaloliakos was indicted on October 3 for “participation in a criminal organization” and remanded in custody, as was the “number 2” of the neo-Nazi party, Christos Pappas. In addition, four police officers suspected of links with the neo-Nazi party were arrested. The release on bail of the neo-Nazis who had been charged indicates that the “parakratos”, this Greek “deep state”, this apparatus that was not purged after the end of the military dictatorship in 1974, remains divided. The Greek press criticized the attitude of the courts after the three neo-Nazi deputies were released: the conservative newspaper Kathimerini had the headline, “Effect of surprise and questions”, while the left-wing daily Eleftherotypia spoke of “Shameful democracy “and Ta Nea had the headline: “The leader is in prison, the gang is outside.” Will the investigation be taken to its conclusion? It is true that Golden Dawn cannot be destroyed by legal measures or by repression by a state apparatus that is illegitimate in the eyes of the broad masses. It is no longer a little neo-Nazi group, but already a small movement that has been able to emerge because Greece is a country devastated by the shock therapy implemented over the last several years under the dictates of the European Union and the IMF. Recession, unemployment and poverty have reached levels not seen in this part of the world since the 1930s, when democracy was destroyed and the entire society was humiliated. It is not possible to fight against Golden Dawn without fighting simultaneously against those policies which have enabled it to grow. To fight fascism we must build an antifascist movement based on the broadest possible unity. But this unity must not, in any way, serve as a pretext for building bridges with the parties or the system that have fed the growth of fascism. This union can only involve all the forces involved in the popular resistance against austerity, against the memoranda imposed by the troika. Jan Malewski is editor of Inprecor and a member of the Executive Bureau of the Fourth International.